Many people are afraid of having diarrhea because, aside from the fact that this illness is very inconvenient, it is equally embarrassing. Diarrhea also induces a fear in every person, as people who suffer from it tend to have an aversion to the food that they ate which they think are the culprits for the occurrence of diarrhea. Diarrhea is medically defined as the increase in the frequency of bowel movements. This means that a person who is suffering from this illness will typically have more bowel movements than normal – usually three to four times a day. Since the maximum number of bowel movements that people are likely to experience in a day is three, then diarrhea is defined as something that exceeds this specific number. There is also looseness in stool for people who are experiencing diarrhea. Usually, this consistency in stools is greatly dependent of the foods that people eat. If you are a vegetarian, chances are that you will have looser tools compared to those who eat lesser amount of vegetables. Stools that are in liquid forms, or stools that are watery are abnormal and fall into the diarrhea category. Diarrhea occurs whenever there is an abnormal digestion happening inside the intestines. What happens during the normal digestion is that foods are kept liquid due to the water secretion of the stomachs, pancreas, upper small intestines, and the gallbladder. Diarrhea happens when the stomach secrets large amount of water, causing the stools to have too much fluid and then eventually take the liquid form. In most casea of diarrhea, this abnormal secretion of water is caused by viruses, parasites, and bacteria. What they do is that they invade and inflame the lining of the small intestines, or they produce toxic chemicals in order to stimulate the stomach’s lining and provoke it to secrete too much fluid. There are actually two major types of diarrhea: the acute diarrhea, and the chronic diarrhea. The acute diarrhea usually lasts for a few days and symptoms last up to a week. The common causes of the acute diarrhea are viral infection, bacterial infection, and parasitic infections. Acute food poisoning is also responsible for the development of acute diarrhea. The other type of diarrhea is the chronic diarrhea. Some of the main causes of this type are the irritable bowel syndrome, other infectious diseases, bacterial growth in the small intestines, and severe constipation. People who are also using laxatives in order to lose weight are also prone to chronic diarrhea. 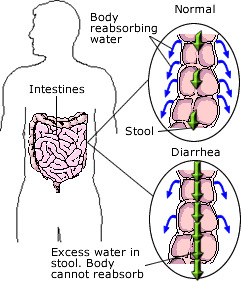 Diarrhea is inconvenient because dehydration usually occurs during this stage. When people undergo dehydration, what happens is that their bodies lose too much fluid and electrolytes which unable the body into functioning properly. Dehydration is very dangerous in children and in older people because their bodies wouldn’t be able to stand excessive loss of water. When you experience diarrhea, it is important that you get immediate consultation from doctors in order to prevent the further worsening of the illness. Doctors will provide the necessary medications to prevent the symptoms from reoccurring.